On this page, you will find all different kinds of magic mushroom grow kits. If you order these in our web shop, you will receive all the equipment that you need to grow shrooms at home. These are always accompanied by instructions, so that you can harvest the perfect mushrooms. Seeing as our grow kits are complete, all that you must do is grow them for a few weeks before you start harvesting. Growing shrooms on your own is the perfect way to enjoy fresh magic mushrooms, which generate a fantastic effect. Are you curious about our selection? If so, view all our other mushroom grow kits below. In the Netherlands, the purchase and sale of magic mushrooms is prohibited, but buying and selling grow kits is entirely legal. That means you can get to work on your home growing with our shroom kits worry free! Truffles are legal as well. Fruiting bodies are prohibited, but truffles don’t have the fruiting bodies that mushrooms do. It is definitely possible to experience a psychedelic trip with homegrown shrooms! Our grow kits are all-in-one sets, so that you can start growing your magic mushrooms as soon as you receive your order. These grow kits include growing bags, air filters, substrate, paper clips and, of course, instructions. Don’t have a lot of experience growing shrooms? 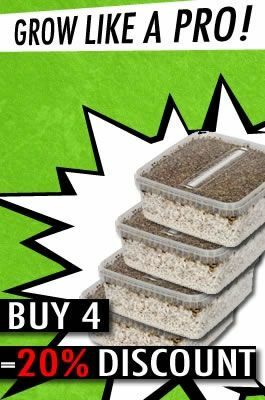 We recommend the Cambodian Shroom grow kit. This kit contains all the equipment for building a complete grow box in just three steps! There is minimal maintenance involved after setting it up, too. The only thing that you have to do is water the kit and then put it in the grow kit. This kit comes with hardly any risk of a failed harvest. Review our other grow kits and read the product descriptions, so that you choose the shroom grow kit that works best for you. Do you have any questions about using our grow kits? Please feel free to contact us!